Just wanted to send you a note about our ‘Special Event’ this weekend. If you have the time, please try to get in touch with us for the: ‘Little Town on the Prairie’ radio event. I will be out ON the Laura Ingalls Farm with the Huron Amateur Radio Assoc. Group, ‘tending’ a station! Laura Ingalls Wilder Pageant – Special Event Station at De Smet, South Dakota — June 29 & 30, 2013. W0NOZ – June 29, 2013 Start at 1600 utc and run until June 30, 2013 2359 utc. Operating frequencies- 14.265 Mhz and 7.265 Mhz and 18.155 Mhz. We will provide you with mailing envelope, mailing label, postage, certificate and Qsl when you send $2.00 to: Huron ARA,Inc., PO Box 205, Huron, SD 57350. 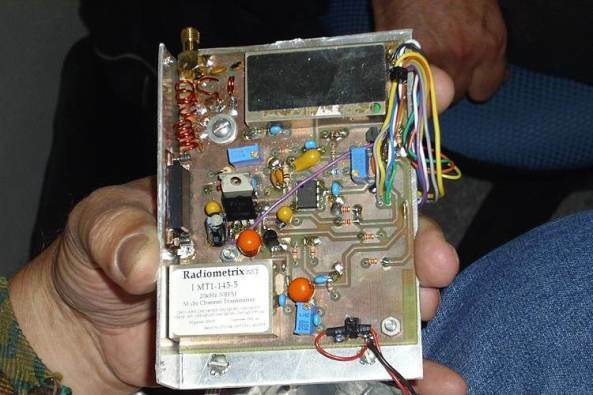 Read more: AMSAT-LU Ham Radio High-Altitude Balloon to fly FM Repeater and SSTV | AMSAT-UK. Public Demo of Emergency Communications June 22-23 Pierre / Ft. Pierre, SD June 22-23 – Despite the Internet, cell phones, email and modern communications, every year whole regions find themselves in the dark. Tornadoes, fires, storms, ice and even the occasional cutting of fiber optic cables leave people without the means to communicate. In these cases, the one consistent service that has never failed has been Amateur Radio. These radio operators, often called “hams” provide backup communications for everything from the American Red Cross to FEMA and even for the International Space Station. Pierre / Ft. Pierre “hams” will join with thousands of other Amateur Radio operators showing their emergency capabilities this weekend. Over the past year, the news has been full of reports of ham radio operators providing critical communications during unexpected emergencies in towns across America including the California wildfires, winter storms, tornadoes and other events world-wide. When trouble is brewing, Amateur Radio’s people are often the first to provide rescuers with critical information and communications. On the weekend of June 22-23, the public will have a chance to meet and talk with Pierre / Ft. Pierre ham radio operators and see for themselves what the Amateur Radio Service is about as hams across the USA will be holding public demonstrations of emergency communications abilities. This annual event, called “Field Day” is the climax of the week long “Amateur Radio Week” sponsored by the ARRL, the national association for Amateur Radio. Using only emergency power supplies, ham operators will construct emergency stations in parks, shopping malls, schools and backyards around the country. Their slogan, “When All Else Fails, Ham Radio Works” is more than just words to the hams as they prove they can send messages in many forms without the use of phone systems, internet or any other infrastructure that can be compromised in a crisis. More than 35,000 amateur radio operators across the country participated in last year’s event. “The fastest way to turn a crisis into a total disaster is to lose communications,” said Allen Pitts of the ARRL. “From the earthquake and tsunami in Japan to tornadoes in Missouri, ham radio provided the most reliable communication networks in the first critical hours of the events. Because ham radios are not dependent on the Internet, cell towers or other infrastructure, they work when nothing else is available. In the Pierre / Ft. Pierre area, the Pierre Amateur Radio Club (PARC) will be demonstrating Amateur Radio at Capitol Heights Baptist Church on Hwy. 14 N. of Pierre, June 22-23. They invite the public to come and see ham radio’s new capabilities and learn how to get their own FCC radio license before the next disaster strikes. Amateur Radio is growing in the US. There are now over 700,000 Amateur Radio licensees in the US, and more than 2.5 million around the world. Through the ARRL’s Amateur Radio Emergency Services program, ham volunteers provide both emergency communications for thousands of state and local emergency response agencies and non-emergency community services too, all for free. To learn more about Amateur Radio, go to www.emergency-radio.org. The public is most cordially invited to come, meet and talk with the hams. See what modern Amateur Radio can do. They can even help you get on the air. If you’re interested in helping out this weekend or finding out more about Amateur Radio, please leave your comments below and someone will get back to you. The Black Hills Amateur Radio Club will be hosting its annual tail gate swap and equipment auction on July 13,2013 at the Club House located on Plymouth Drive, just off Radar Hill Road. The gate to the site should be open by 9:00 AM and we plan on being done by around noon. Bring any items you would like sell / swap and set up your display area (trunk, tail gate, your own table or on the ground). The following equipment is from the estate of Rick Guth (KC0RMQ) and will be offered for sale. The IC7800 will be sold by email auction which will begin a few weeks before the sale, details to provided shortly.